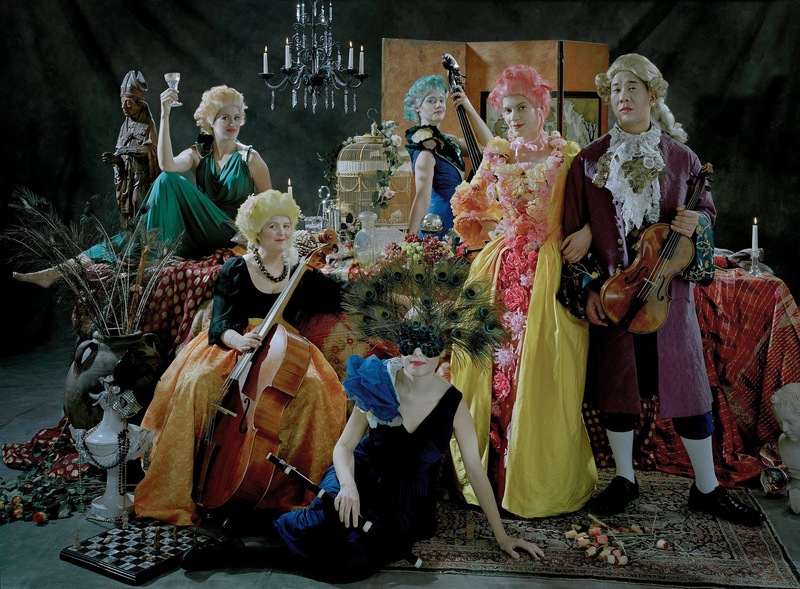 The Little Baroque Company is a lively young period performance group originally founded at the Royal Academy of Music in 2005. For their performances of Bach's Coffee Cantata they present the work in a brilliant re-invention, re-interpreting the work for modern audiences whilst being true to the spirit of Bach. At this year's London Handel Festival event for festival friends and supporters, the Little Baroque Company performed the overture to Handel's Ariodante, Bach's Orchestral Suite No. 2 in B minor BWV 1067, and Bach's Coffee Cantata BWV 211 in the Great Hall of Charterhouse. The instrumental ensemble was led by Helen Kruger and featured Eva Caballero on flute, with Bach's cantata being sung in a new translation by Carla Blackwood, with Nina Lejderman, Richard Latham and Andrew Glover, designer Elizabeth Gadsby, concept Jacqueline Dossor. The Charterhouse is one of the great London survivals and before the concert there was a chance to explore the new museum on the site and the 17th century chapel. The concert took place in the Great Hall, a room originally part of the Tudor mansion which replaced the original Charterhouse. with its tempting views of the gardens. The small instrumental ensemble (Helen Kruger & Anna Curzon violins, Nichola Blakey viola, Anthony Albrecht cello, Eva Caballero flute, Pippa Macmillan double bass, Katarzyna Kowalik harpsichord) all performed in costume, colourful modern re-inventions of period dress (the 18th century on acid as someone described it afterwards), which added a touch of humour to the event. But the music making was all seriousness, with Handel's overture to Ariodante having a grave beauty. Bach's Suite No. 2 in B minor really showcased Eva Cabellero's lovely, warm-toned and fluent flute playing. The performance was highly characterful, with the individual players taking care to bring out the varying moods of Bach's music, from strongly accented dance movements and more intimate moments to the sparkling badinerie which concludes the work. Not every detail was perfect, but this was playing with heart and character. The atmosphere really lifted when the singers entered for Bach's cantata, starting the piece immediately without any pause. Normally the group performs in the round but this was not possible here, instead they wandered around the auditorium really engaging with their audience. Nina Lejderman made a charming;y characterful Lisa, her aria to coffee with flute obbligato was a complete delight and we could revel in the glorious mis-match between Bach's poised music with the lovely flute solo, and the coffee-crazed words. As Lisa's father Schlendrian, Richard Latham took time to find his form, and performing in such close proximity to the audience is very much and art. But Latham developed a nice sense of Schlendrian's sly character. For Lisa's final aria, both singers wandered around the room, looking for a husband for Lisa amongst the men of the audience, to superb comic effect. Tenor Andrew Glover had little to do, but made it commanding, and all three singers joined together for the lively final chorus. The company's performances are usually immersive in another way, the audience is served coffee & cake during the performance. At Charterhouse we partook afterwards, in the historic cloister with an opportunity to chat to the performers.